At SMACK! Media, we are a team of athletes and wellness enthusiasts, fueled by competition and driven to excel. Athletically, we know that upping our mileage or increasing the amount of time spent recovering often equates to more success. In Public Relations however, the correlation between pitching and media placements is not entirely direct. Communication today is easier than ever with email, text, and social media. 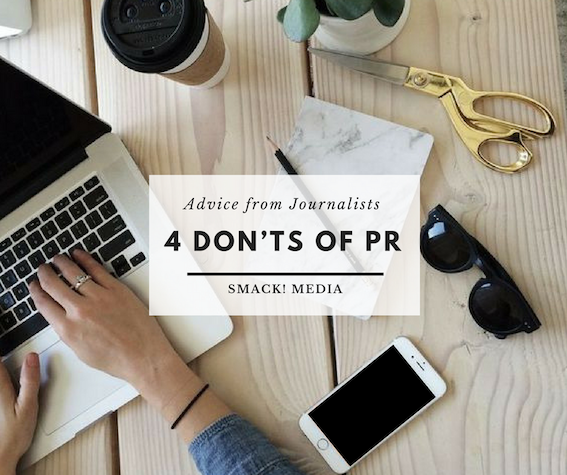 PR professionals capitalize on these resources by sending more emails and directly messaging pitches to journalists via social media. As a result, the inboxes of writers and editors are ridiculously overflowing, forcing them to be less forgiving with the delete button, and causing them to roll their eyes when a PR rep tries to sneak work into their personal life by pitching through social media. We reached out to industry leading journalists for their best tips and suggestions on how PR reps can successfully secure editorial placements for a brand, person, or story. Special Thanks: To all the writers and editors who contributed to this feature! This is the first of three posts for a series on this topic. We hope that publicists, entrepreneurs and agencies learn from this feedback and incorporate these Do’s and Don’ts into their strategy. #1: Don’t send pitches that are irrelevant to the writer or publication; Do research. The reality is that more pitches do not equal more placements, but more targeted pitches do. So before sending a pitch, make sure you do your homework and understand what topics are appropriate and important to a writer’s and publication’s audience. #2: Don’t pitch via social media; Do pitch via email. The same way you don’t want your boss commenting on your Instagram, “Hey cool photo, but can you send me that report?” writers and editors don’t always want to mix their personal and work life. #3: Don’t rely on spell check; Do write, read, and read again. Yes, we have all prematurely hit send and seen an email fly off with a blatant mistake, but prioritizing proofreading could be the difference between a pitch being accepted vs. immediately deleted. #4: Don’t waste time writing elaborate subject lines; Do send concise product descriptions and images. We suggest sticking to a straightforward subject line like, “New Paleo Grass Fed Protein” or “Pro Athlete Picks for Recovery Tools.” Use this extra time to focus on the body of the email. Include product descriptions and embed images. When it comes to highlighting product specs and selecting images remember these 3 C’s: Concise, Creative, and Clear. Again, more words or images do not equal more placements.